For the last two summers I’ve been very stressed over the condition of my hydrangea bushes. Last year there was one blossom. One, about the size of a golf ball. 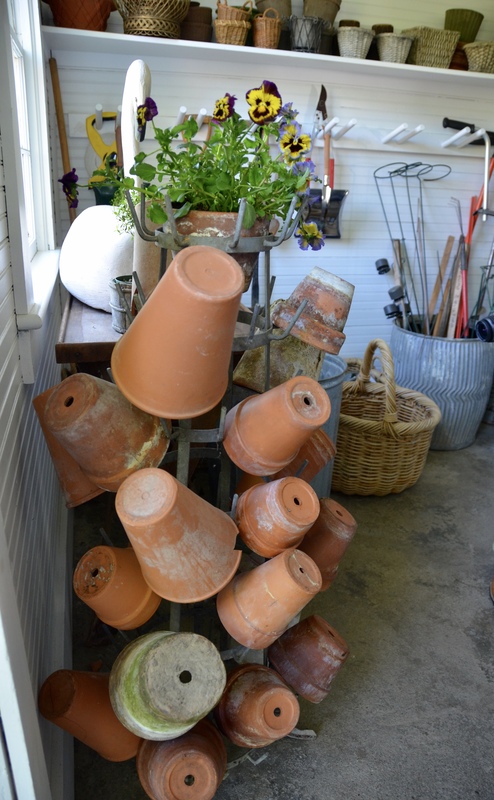 After wicked winters, hurricanes, and early frosts, I feared the worst! But these beauties are of hardy stock, and this year I am happy to report that the bushes are bursting with blooms in every glorious shade of pink, lavender and blue. 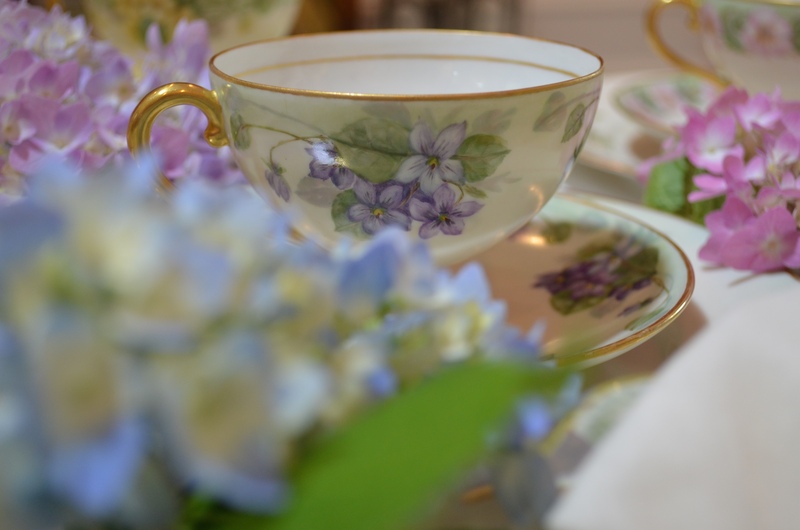 What better reason to have a pretty tea party? This week The Novel Bakers are sharing The Vintage Tea Party Books by Angel Adoree, three wonderful collections of recipes and ideas for giving the perfect vintage tea party. 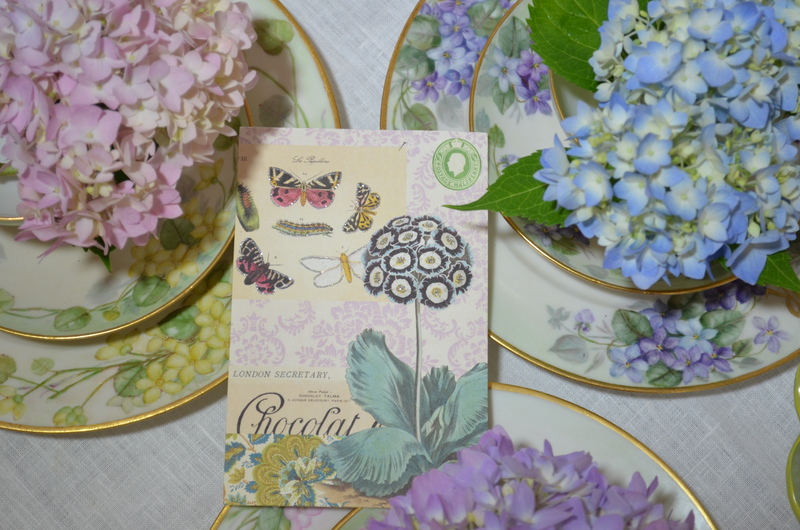 Vintage tea parties require vintage elements, and because I’m so happy about my flowers, I am going to use some very special tea cups. Around the turn of the last century young women painted china as an artistic hobby. My cups and plates were hand painted by Mr. Fun’s grandmother and I now have the privilege of caring for them. Nana was born in 1899 and lived to be an active and alert 101 year old, interesting, intelligent and talented woman. I think the cups and the luncheon plates are marked with her monogram. 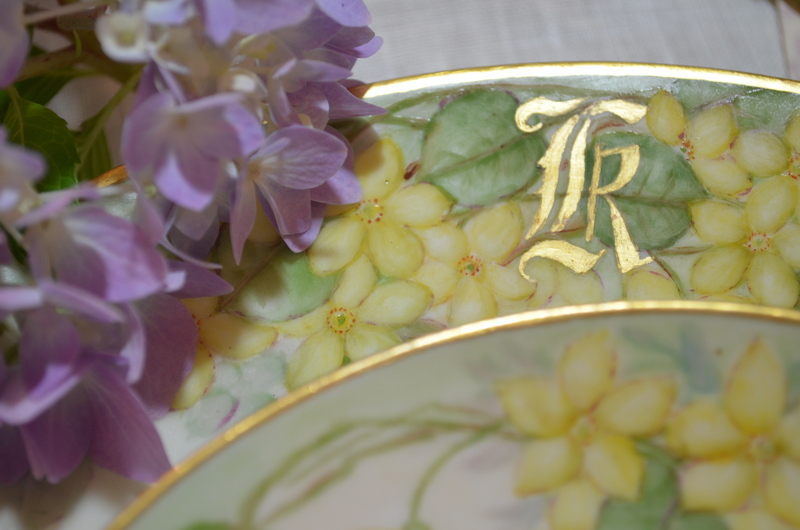 The monograms and brilliant edges and handles are painted with gold. 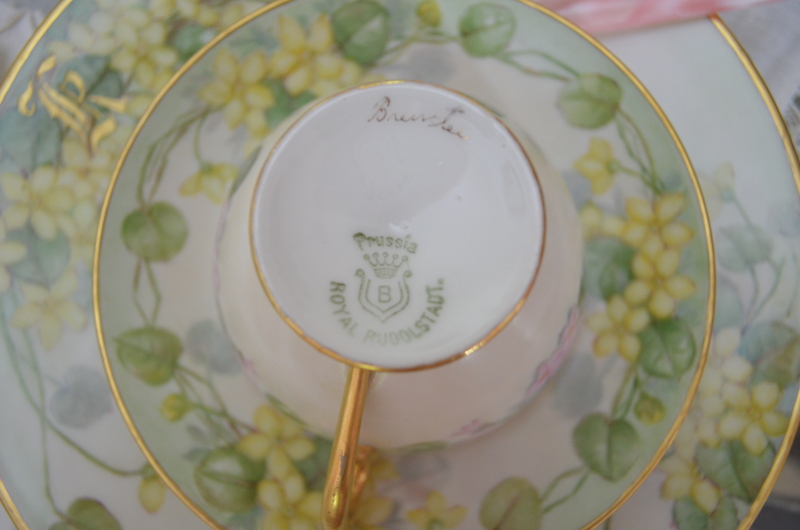 The paper thin porcelain pieces with tea cups perfectly balanced for sipping tea have a backstamp indicating that they were made in Prussia. We are using four of the six at our tea table today. I think ‘buttercups’ when I see this set. Any ideas as to these? Could they be hydrangea? And these, I think, are wild roses. 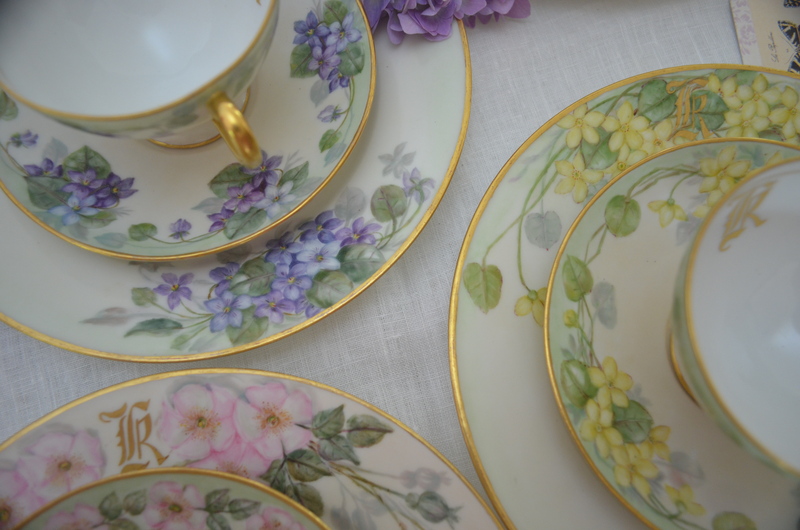 For all the years that I knew Nana these beautiful pieces were locked away in her china closet. They are much prettier on a table, ready to hold our tea and other goodies. 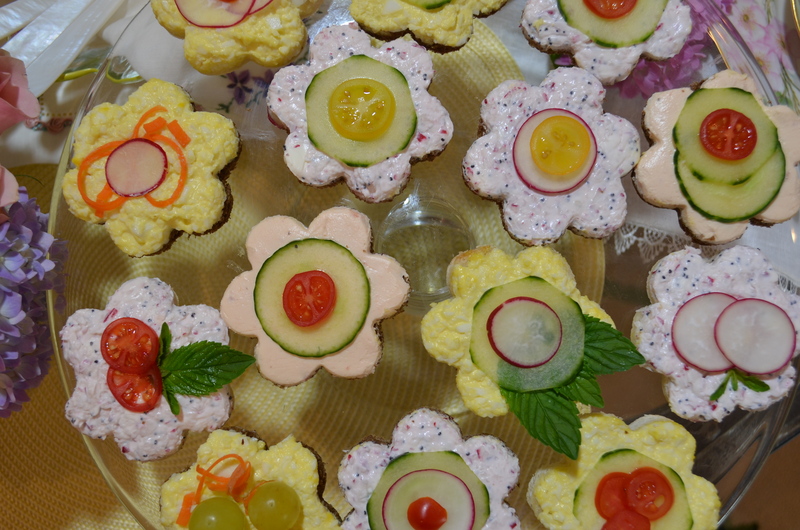 We have flowers on the cups and flowers from my yard, so why not have some flower finger food too? 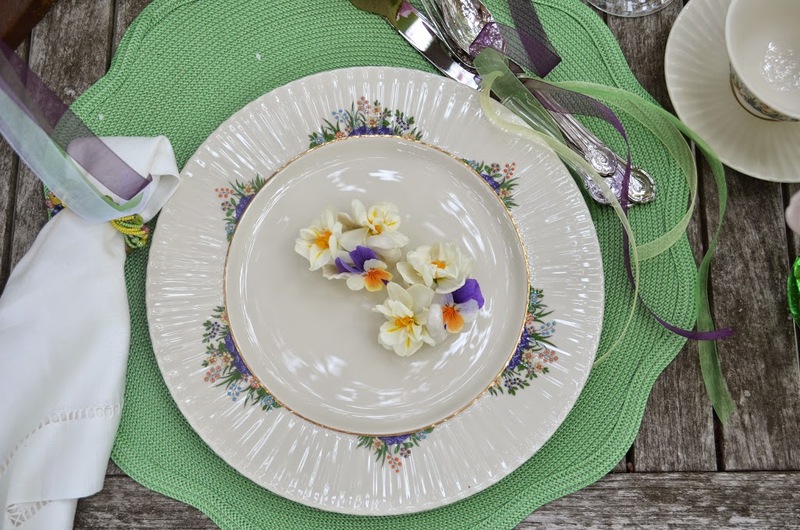 Edible flowers are strewn throughout the pages of The Vintage Tea Party books, but my culinary skills are a little weak, so I’ll spare us the possibility of eating the wrong ones, and instead combine the idea of edible flowers and tea sandwiches you often find at a proper tea. I used recipes from the books and adjusted them a bit, then cut the breads (a soft white and a pumpernickel) with a flower cookie cutter. 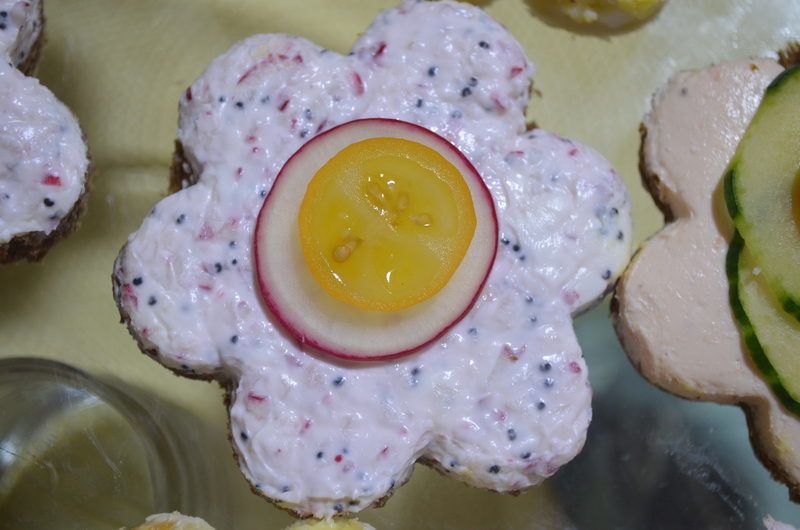 Radish and poppy seed with a cream cheese base are easy to whip up and are delicious! The scent of fresh radish filled the air as I whipped them up in the food processor! The ladies in those vintage times must have chopped forever! I love a good chunky egg salad on grainy bread with large juicy tomatoes, but in my living room I would prefer neat food. So I made the egg salad and again whipped it up in the food processor to make a fine spread. We also like bagels and lox with cream cheese, again not appropriate for a tea party, so my dainty take on this classic was to use salmon flavored cream cheese and top it with cukes and tomatoes. Now the general rule at a fancy affair or cocktail party with passed plates is that the tiny toppings indicate what is inside the finger food, but as our party is small you can always ask the hostess (me!) if you are unsure. 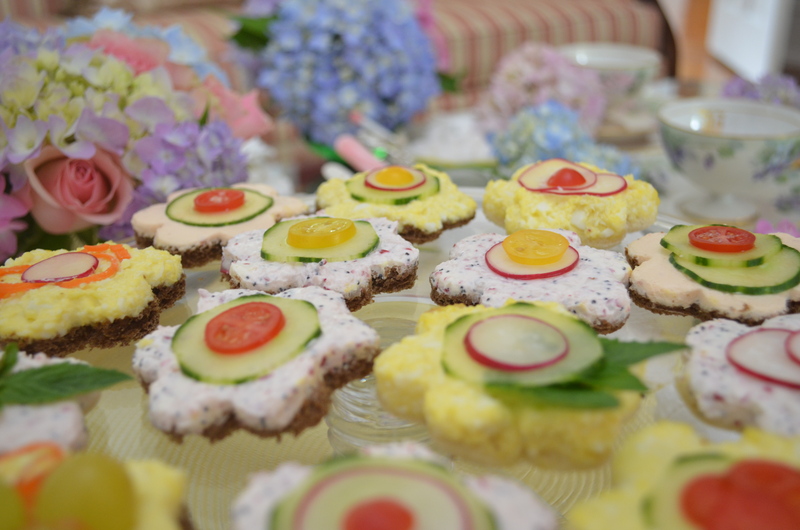 I used very finely sliced radishes, cucumbers, and cherry tomatoes, carrots curls and mint from the yard to create a flower garden of tea sandwiches. A little sweet bit is always a good way to end, but I’m warning you now that you may want to look away. Just close your eyes and pop this tidbit into your mouth. True confessions. The first batch looked even worse, so I “disposed” of the evidence. Every last delicious, gooey, sweet morsel. Just think about this: brioche and nutella, fried in real butter. And a raspberry. 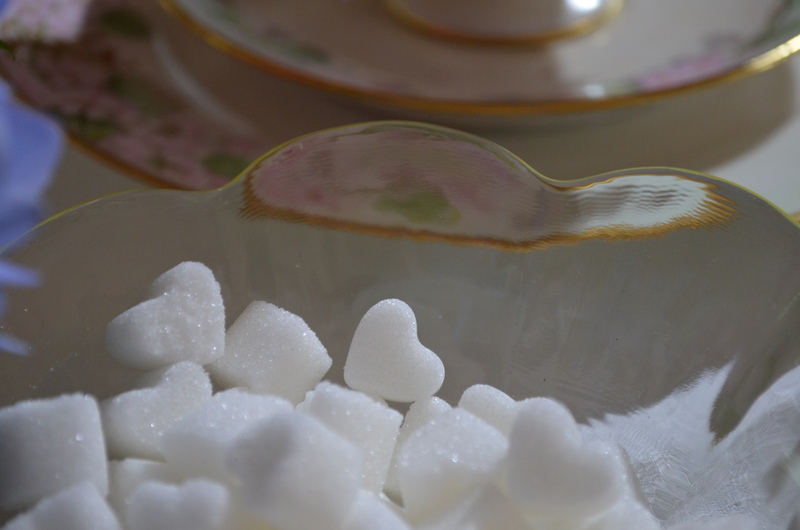 If you prefer to get your sweet kick in your tea cup, add a few sugar hearts. These were the easiest part of this table! Mix sugar with a few drops of water, press into a candy mold, and let it sit until it is hard. They are very sturdy and if you are clever you can add icing flowers. Where there are flowers there are usually birds (we have a hummingbird family this year!!). 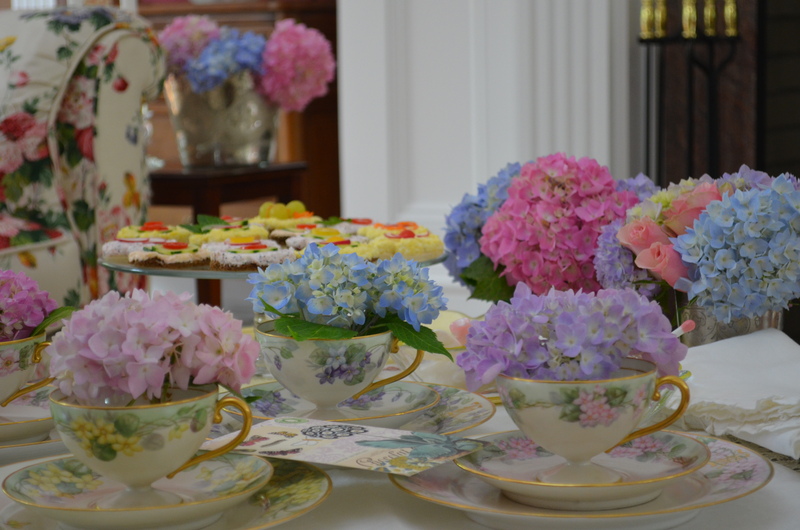 I hope you have enjoyed our tea party as much as I enjoyed preparing and serving it to you. I’ve had so much fun being inspired by The Vintage Tea Party series. I’ll definitely be serving the foods I tried again, and I’ll be having many more tea parties. 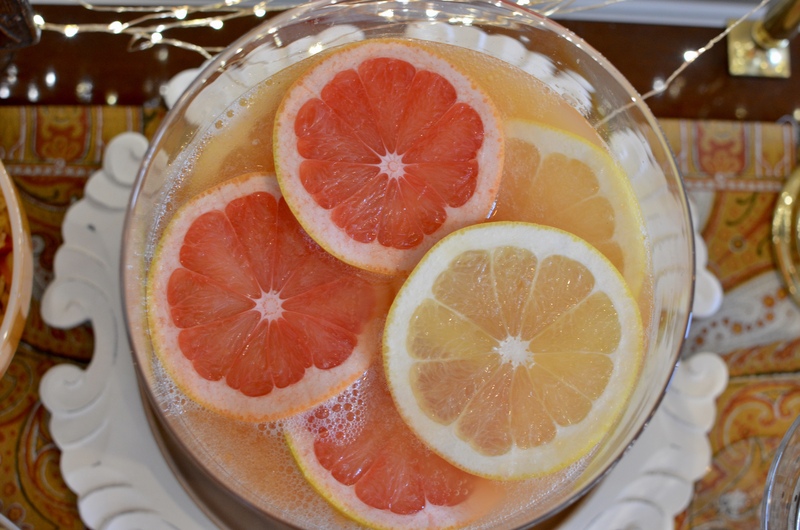 The books include ideas for many types of tea parties, not just pretty and dainty ones. 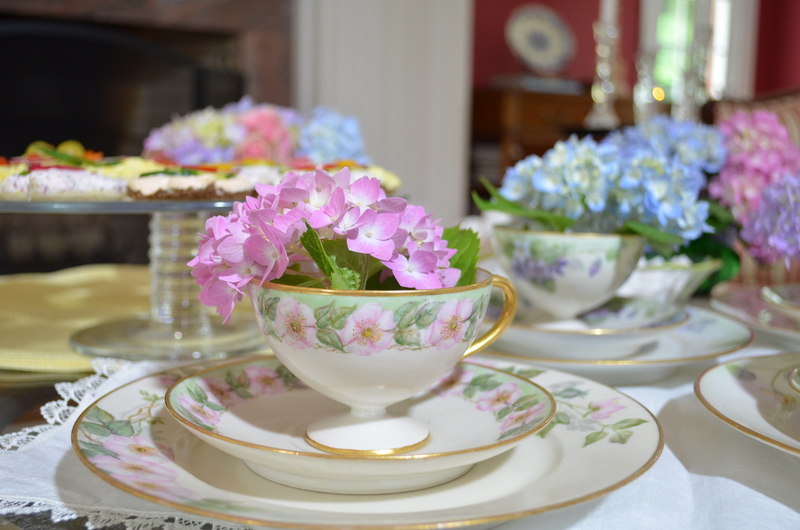 For more beauty, inspiration and ideas for tea parties of every sort, please visit The Novel Bakers. And thank you for having tea with me! Your tea cups are so special and beautiful. I love how you’ve displayed them with the colorful hydrangea blooms. Simply lovely! oh i am wild over your teacups and blossoms, your second pic takes my breath away its so PERFECT! such a darling invitation too! your freshly picked tea sandwiches are ADORABLE! 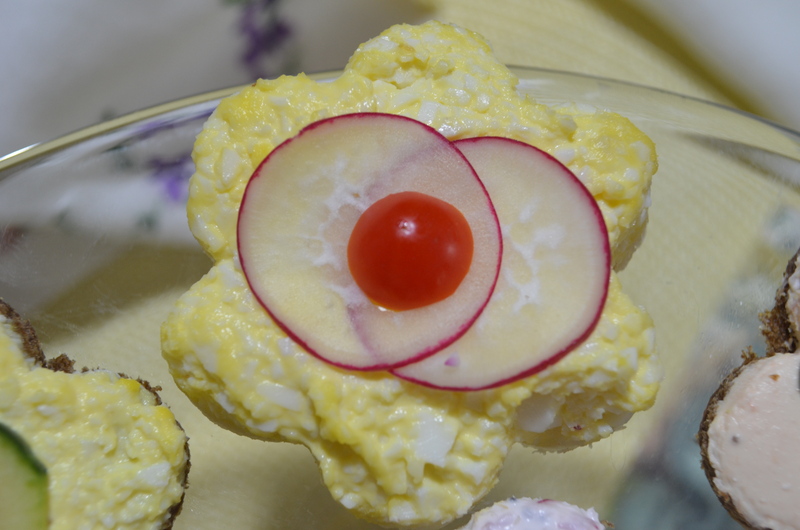 i must say i love your addition of mint and radish to the egg salad, sound divine. i was going to make those nutella morsels, so glad you did i bet they were delish! oh what a delightful afternoon tea with you, WELL DONE and thanks so much for playing, it was fabulous! 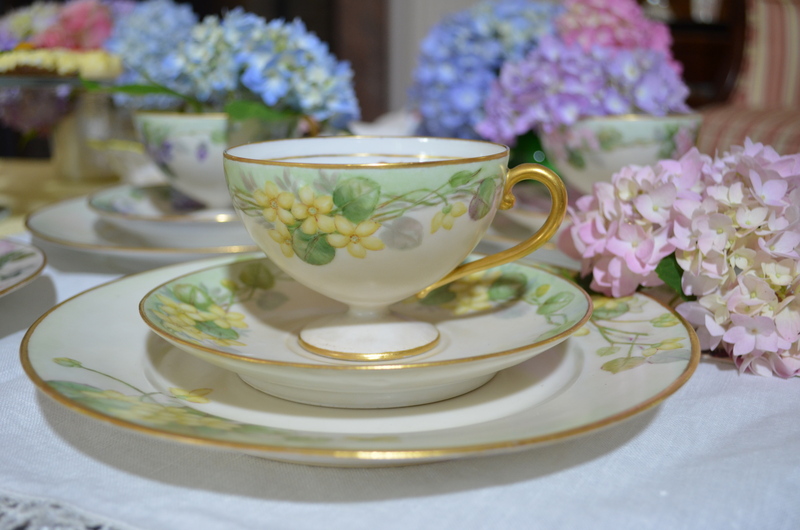 Oh Linda… Your heirloom handpainted collection of teacups are a treasure! 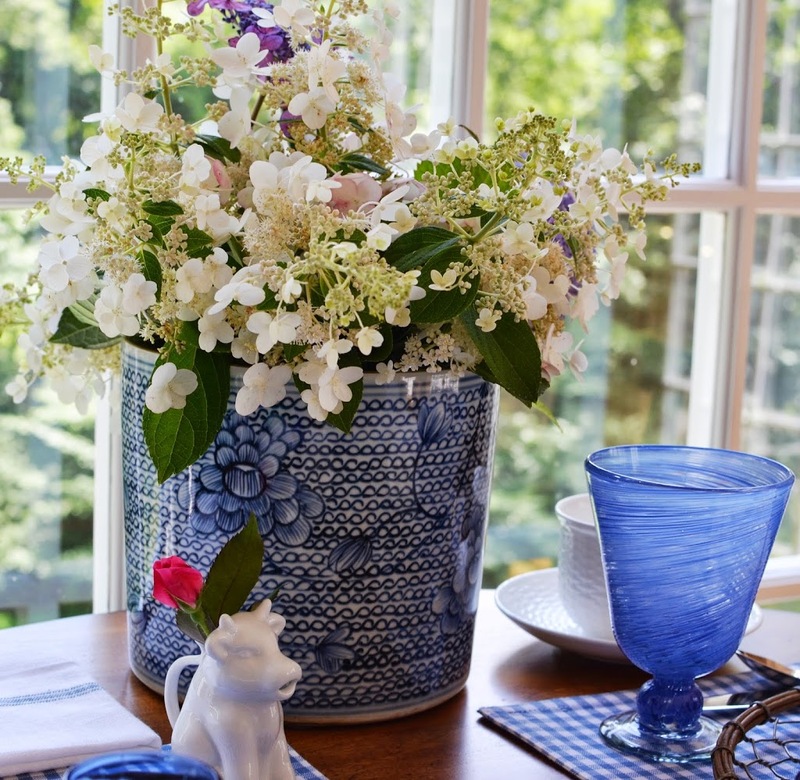 I adore them paired with your blooms, hurrah for hydrangeas blooming! I think our extra cold winter a year ago did a number on everyone’s blooms around here too. I had very few in comparison to previous years but I’m happy to see them rally this year. 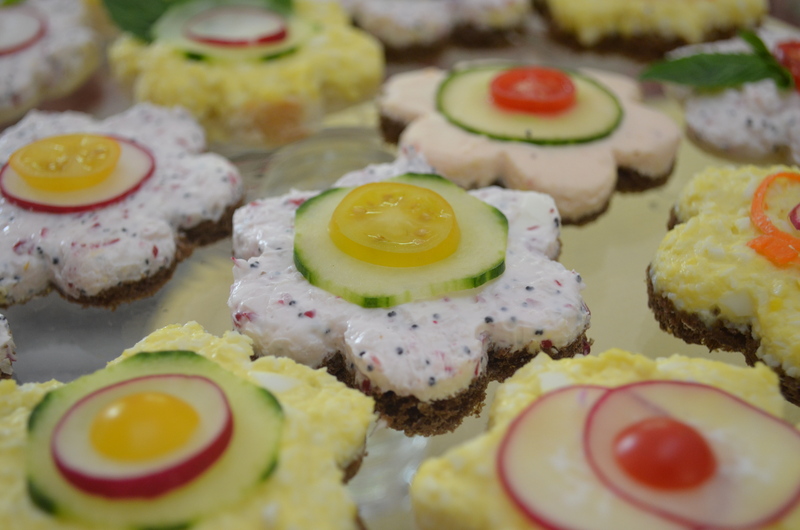 Your variety of blooming flower tea sandwiches are the perfect tea accompaniment, who doesn’t love edible blooms? 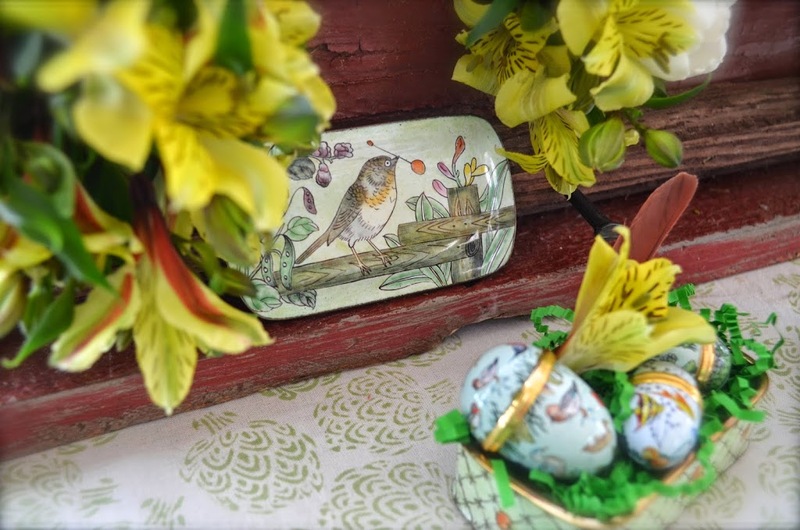 I would love to see an actual hummingbird nesting. My SIL gave me a nest she found after doing some pruning a couple of years ago. I’d never seen one before or so tiny. You’re so lucky to be the keeper of the hand painted China, Linda. 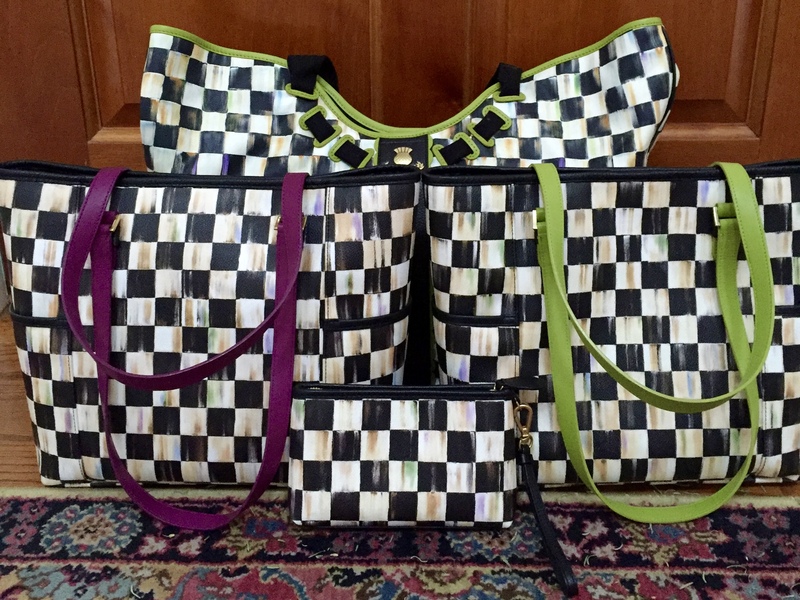 Your patterns are simply stunning! I have six sets that my great Aunt Kitty painted for me as a wedding present and I just love them. I also love your darling flower sandwiches! Look at all those hydrangeas! I have one and only one blossom from two bushes, and I cut it so,that I could enjoy it inside the house. Linda, this was exquisite! 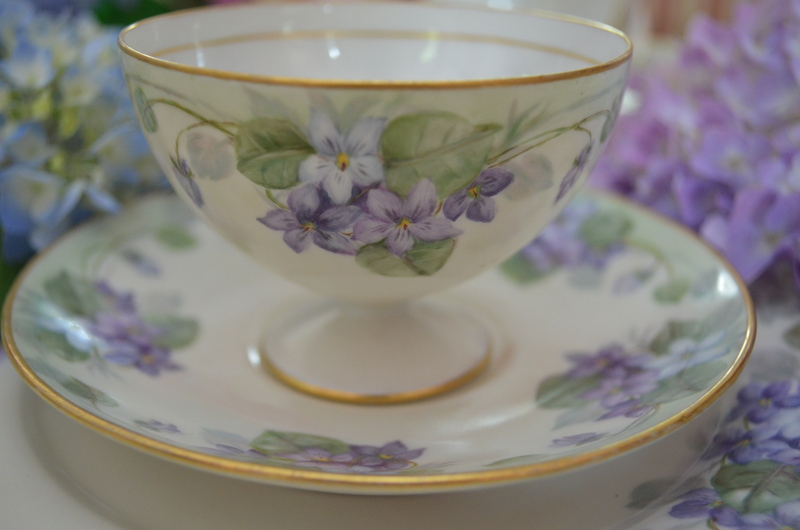 Your antique tea cups are so elegant–Bunny Williams herself would enjoy tea at your home. Your hydrangeas are so pretty and full–I’m still waiting for blooms (the mopheads, not the oak leaf), and yours give me hope. 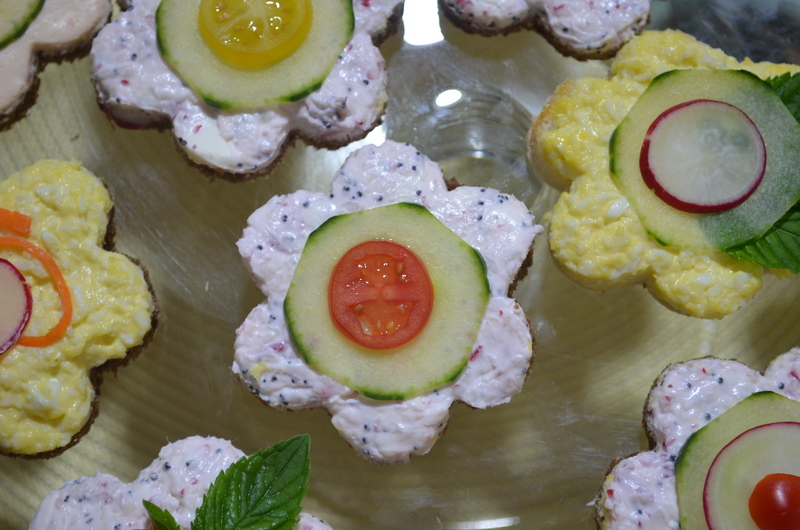 The floral-shaped tea sandwiches carry on the theme beautifully, adding whimsy and deliciousness. 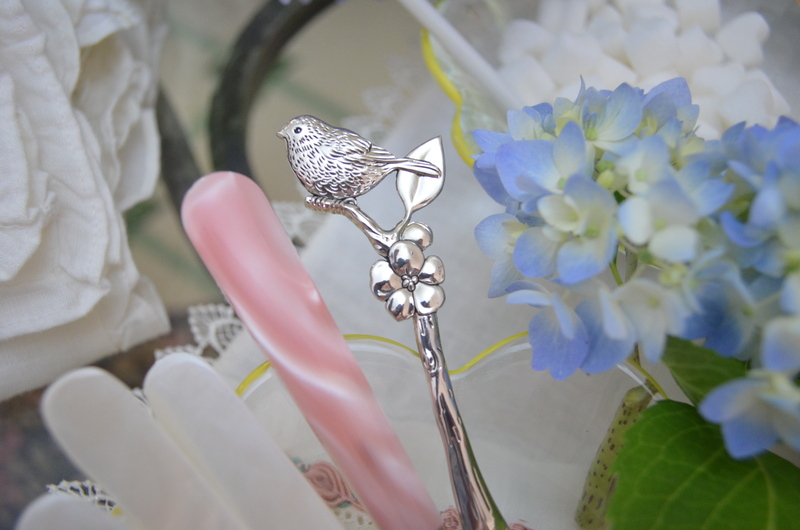 The little bird spoon is one of those things that causes instantaneous joy. And the sugared hearts–oh, my! I just loved having tea with you this week! How utterly beautiful, Linda! I’m so glad that your hydrangea are coming back! Just last year my husband planted a couple of bushes for me, but so far I haven’t seen any blooms. I’m enjoying yours so much, and they really are a perfect accompaniment to these teacups. The china is exquisite, and those little sandwiches . . . I could spend all afternoon nibbling on them. Do you know, I don’t think I’ve ever tried a radish? It looks so tempting! I really get a kick out of these Novel Bakers posts! I can’t wait for the next series! Oh Linda, your hydrangeas are stunning! 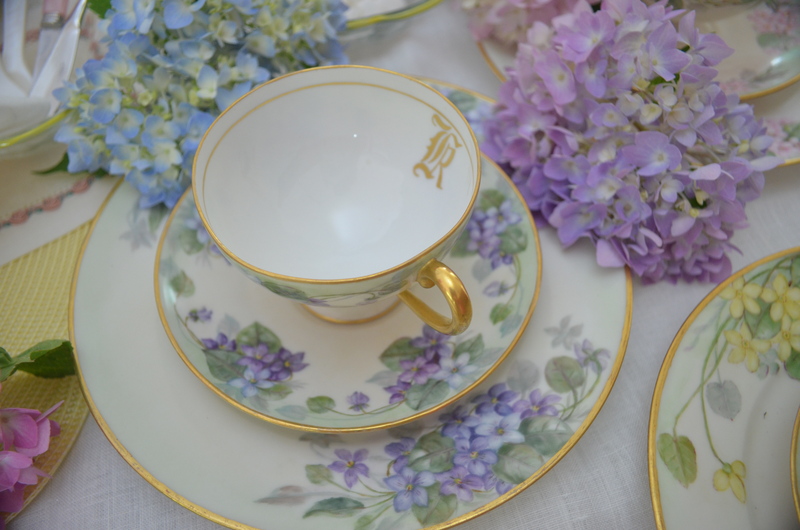 And so perfect for your vintage tea party and fabulous china! By the way, as pretty as edible flowers are, they sorta freak me out, I much prefer you pretty flower sandwich creations! It’s all so feminine and so so special! Thanks for a fun romp with the Novel Bakers! 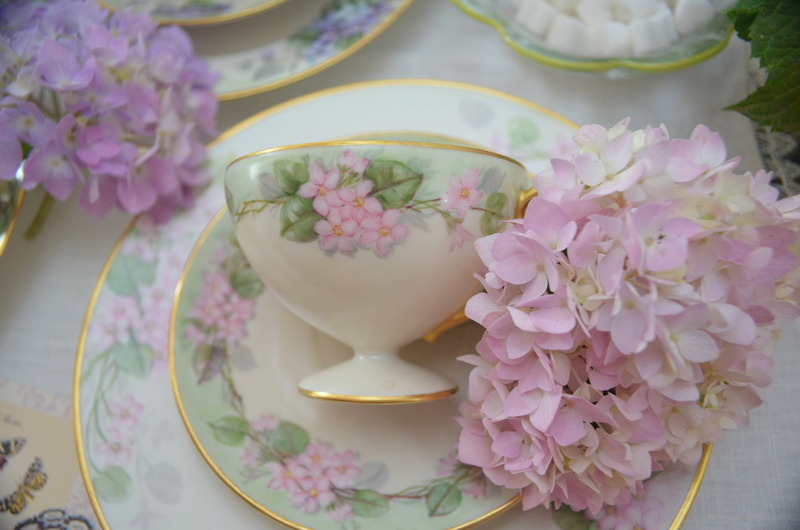 Your handpainted teacups and hydrangeas are gorgeous! Also love the yummy foods. I would have eaten the first batch of brioche and nutella even if their appearances left much to be desired. Beautiful dishes! 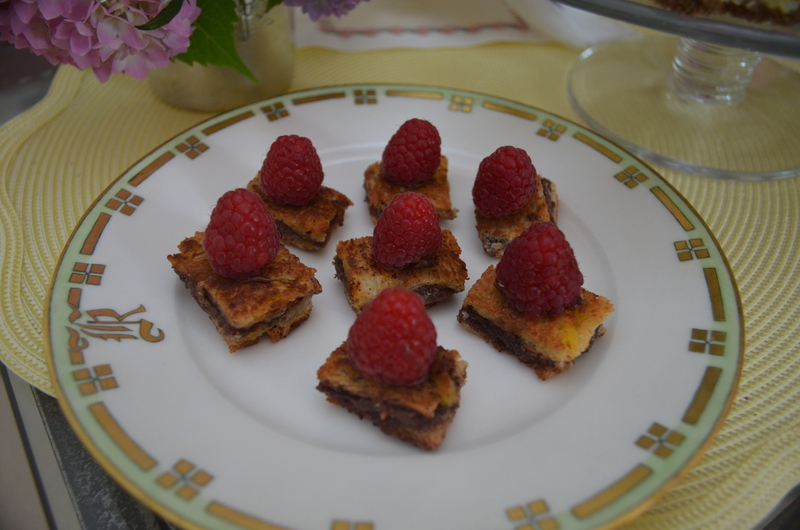 And I love your little tea sandwiches – looks like a lot of work went into making them! Great pics!! Oh my this is so beautiful! 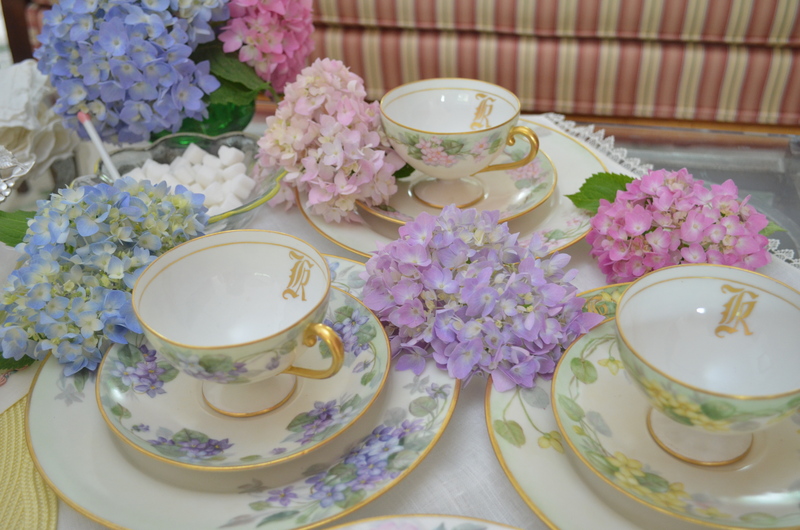 The hydrangeas are gorgeous and so is the tea set. What a lovely set of china to own. 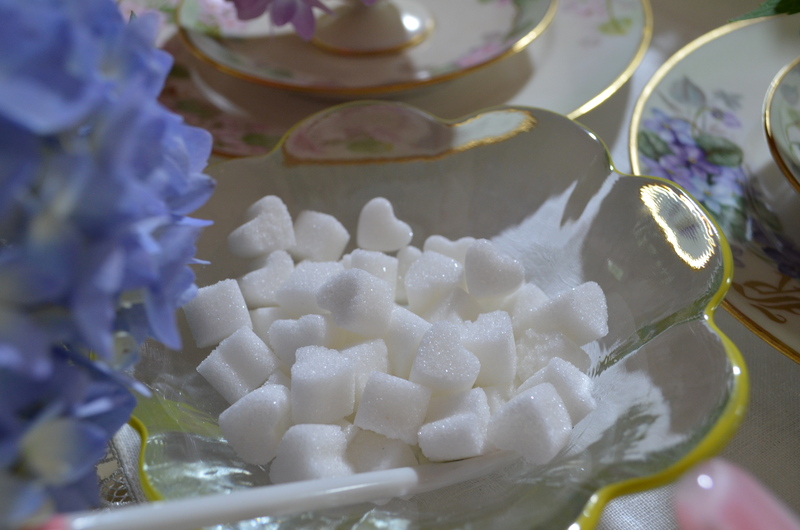 That’s a cute idea for the sugar cubes. The flowery finger good is amazing and the dessert sounds delicious! You sure went all out on this and it’s amazing! What a fun tea party! 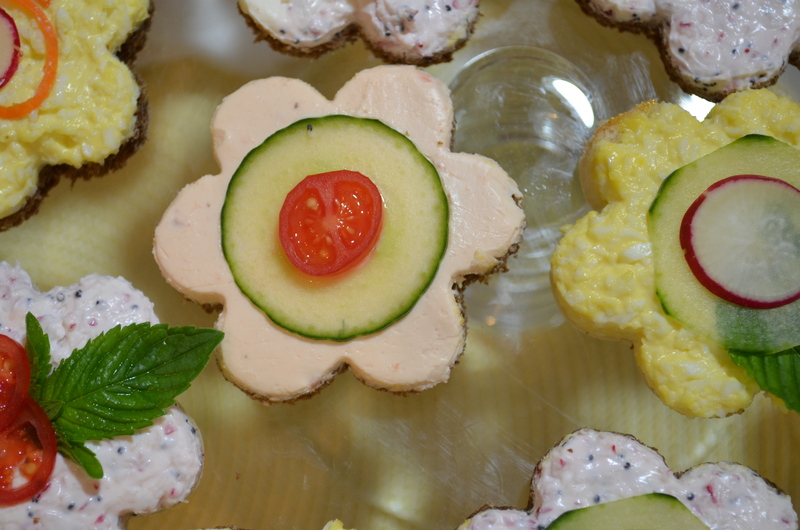 I love how you cut the tea sandwiches into a flower shape… Makes he tea party even more whimsical! Looking from foodie Friday’s and everything else! Oh, these photos are so beautiful! 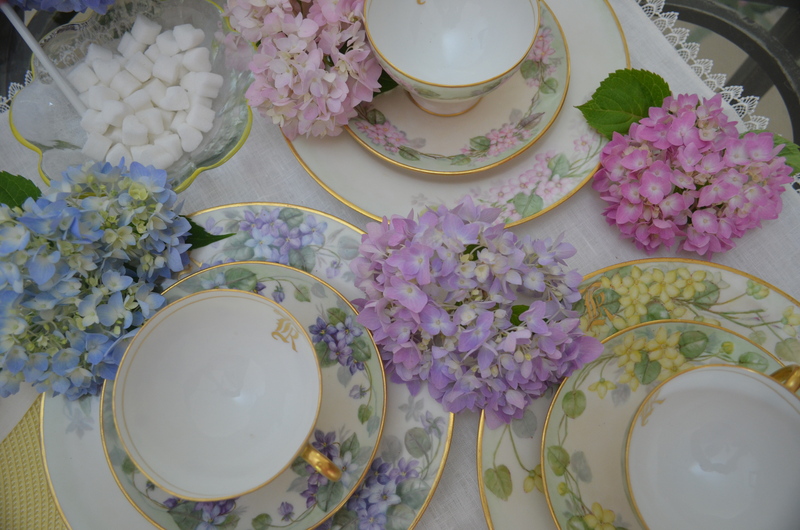 I just love vintage china and your hydrangeas are gorgeous. I was at Home Goods this week looking at their very pretty china teacups. The designs are lovely but they don’t have the same feel, look at the vintage ones. I don’t know what the difference is. These vintage ones are beautiful and the fact that they were your grandmother’s just makes them even more special. Linda, I enjoyed your tea party so much. What a pretty post! 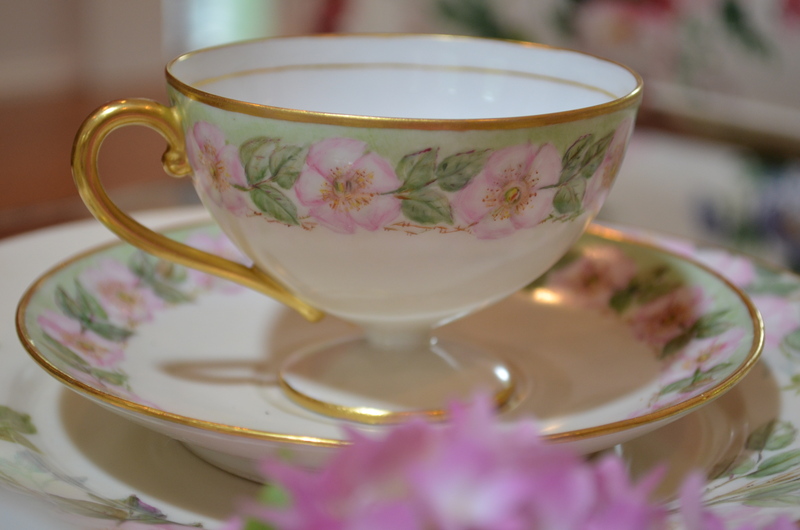 The teacups are little works of art and your Nana was quite gifted with the paint brush. 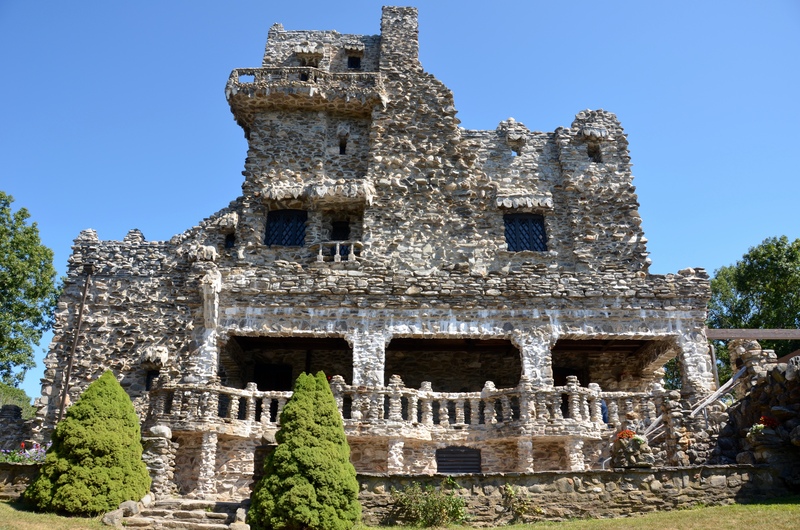 What treasures you have in your possession! 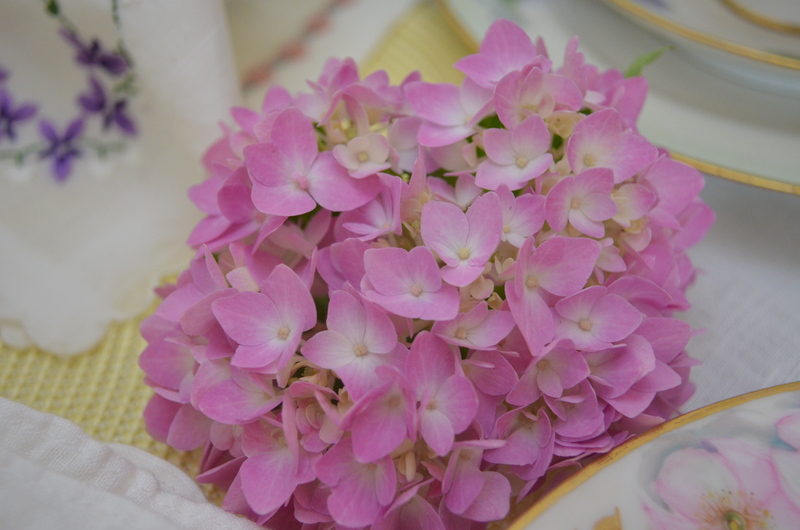 They look gorgeous set out with the colourful pastels of your hydrangeas. Your treats are special too and I know you went to a lot of work to prepare this. So happy you have shared with us and joined me for Tea Time. Happy 4th of July! What a talented lady! The china is all so beautiful! And what a gorgeous displat. I just LOVE Hydranges! This is just the most precious tea time. 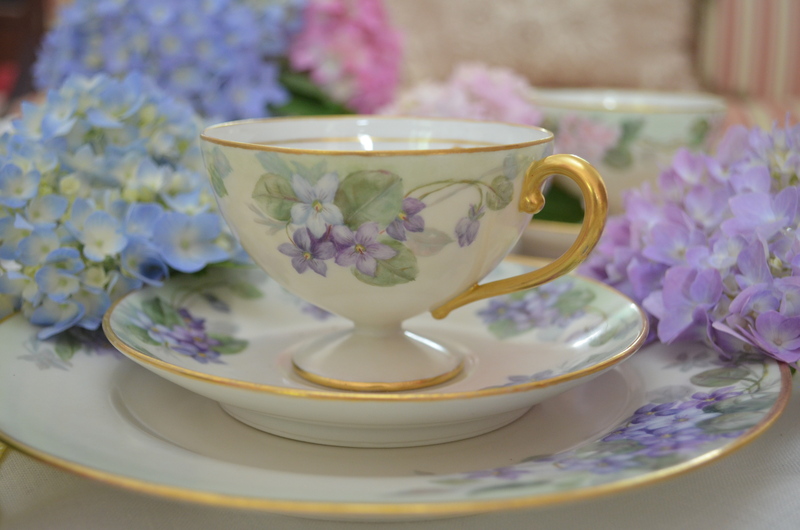 The cups and saucers is absolutely gorgeous especially being hand painted! The flowers were just perfect for the hues blended so well! Have a lovely week! Deliteful! a total violet fan, I luv the set – and your treats are sooo sweet – thanks for sharing! Oh my goodness, this is such a visually stunning post. I don’t know where to begin. 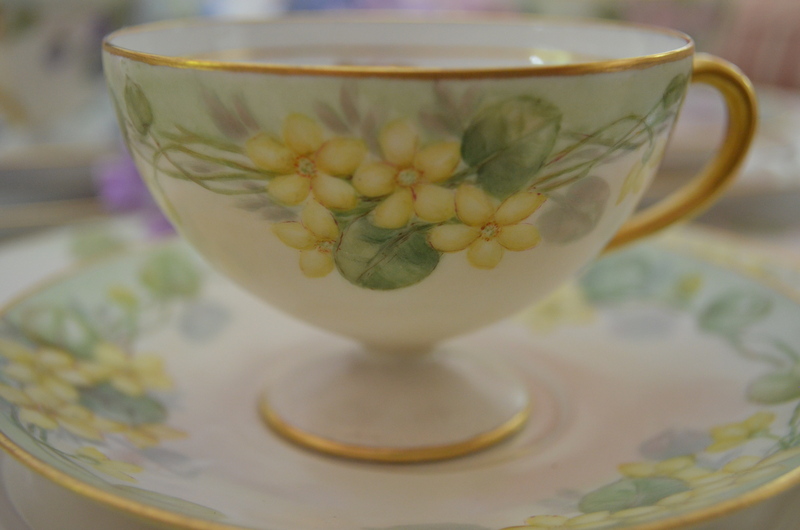 I’m in awe of your family heirloom teacups. Their artistry is breathtaking. I am so glad that they are in a home that appreciates them. All of your food looks delicious and thanks for the sugar heart tip. Your hydrangeas are amazing. I just love their colors and size. Mine are really suffering due to the drought. Thank you for visiting me a couple of weeks ago. I apologize for being so late in visiting you. Nana would be so proud! May I have tea with you? What a delight.